With the yen continuing to climb, newspapers ask if the govt and BOJ have a plan. While the yen was hitting a 15-year high against the dollar in Tokyo, the Nikkei stock index plunged below 9,000 on Tuesday, falling 1.33 percent to finish at 8,995.14, its lowest level since May 2009, amid growing concern over the strength of Japan’s currency and the government’s willingness or readiness to take action. Later trading in New York saw the dollar dipping below 84 yen. As Andy said here yesterday, Monday’s close communication between prime minister and central bank governor, in which they apparently did little more than agree to more close communication, has clearly left markets unimpressed. The fact that Prime Minister Naoto Kan and Bank of Japan Gov. Masaaki Shirakawa reportedly didn’t even discuss intervening to weaken the yen left some sectors of the press here incandescent. Japan’s largest financial broadsheet, the Nikkei, and the biggest daily, the Yomiuri, again called for action by the government. 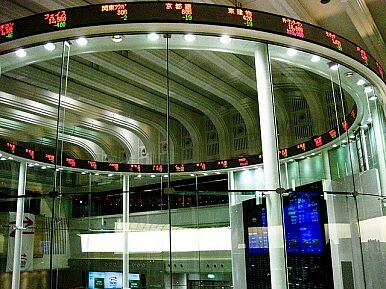 The Nikkei in its Tuesday editorial claimed that Prime Minister Naoto Kan and Bank of Japan Gov. Masaaki Shirakawa hadn’t met in person to discuss what they planned to do at this stage because essentially there was no plan or agreed course of action. The Democratic Party of Japan could not be excused for delaying taking action on economic matters while it held its party leadership election, the Nikkei concluded. For its part, the Yomiuri almost questioned the credibility of the Cabinet spokesman’s statement that Monday’s telephone conversation hadn’t touched on the intervention issue. It again called for intervention of the non-sterilized variety, which also has the effect of monetary easing. If the DPJ administration doesn’t want to intervene in the market that’s one thing, but not even discussing really does give the impression of floundering indecision. But if the real aim is to conceal what action will be taken before it is executed, surely it would be better not to comment at all on the content of highly anticipated telephone calls.